At Yogazone we respect your right to privacy. We will only use information about you in accordance with the Data Protection Act 1998, General Data Protection Regulations 2018 and other relevant legislation and regulations. We collect and maintain information which identifies you in order to provide our services to you including courses and events at Yogazone Studio. We collect the information you provide, such as email address, mailing address or telephone number in case we need to contact you. to manage any application process to one of our courses such as a Teacher Training or Workshop. We hold your name, email address, mobile contact, location and records of workshop attendance on our mailing list, in order to communicate with you regarding our events workshops and classes. 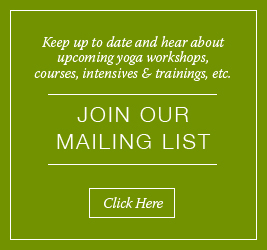 You have given these details to us when you signed up to our mailing list or booked to attend a workshop, training or course of classes or expressed an interest in the studio events or classes. We also may keep basic health information that you supplied at courses or events to provide as background information which is used initially as part of our safeguarding procedure to ensure that everyone attending courses/classes are doing so safely, and also kept as evidence to protect us in case of later litigation in compliance with studio insurance. Some of our events include children and we hold the young person’s name, guardian names, contact details of guardian, DOB as required. Your digital data is stored digitally and to keep it safe it is protected by a firewall & network security, anti-virus software and other safeguards. Hard copies are stored in a locked cupboard in a secure office location. Access to your information is only allowed by the Yogazone manager, website administrators and software developers. All information is kept for a period of 7 years for Insurance purposes. We promise that we will only use your data for legitimate business purposes and will never give or sell your details to anyone unless you give us explicit permission, or we are legally required to do so. You have a right to see any personal information which we hold about you on written request. We are not responsible for the data policies or procedures or the content of websites linked to Yogazone. We do not export your data to any third party processor. All our IT and hosting systems are supplied by GDPR compliant organizations. We will ensure that personal data we hold is accurate and kept up to date. We will check the accuracy of any personal data at the point of collection and at regular intervals afterwards. We will take all reasonable steps to amend or destroy inaccurate or out-of-date data at your instruction. From time to time we may from ask you to refresh with your permission , your details at anytime where we feel our data is out of date. If your data is inaccurate you can contact us at info@yogazone.ie and we will amend it.